Sponsors and CROs who have traditionally managed their Trial Master Files (TMFs) on paper have seen significant improvements when migrating to an electronic Trial Master File (eTMF) system. However, the exchange of TMF content between sponsors, CROs and other stakeholders has remained challenging as they often use systems provided by different eTMF vendors. The TMF Reference Model has partially solved this problem. The model is an emerging standard that has provided a common structure for essential TMF documents. However the problem of exchanging TMFs between different vendor systems remains due to the lack of a common exchange standard. The eTMF Exchange Mechanism Team, a sub-group of the TMF Reference Model project has published the eTMF Exchange Mechanism Standard (eTMF-EMS) v1.0 as a specification for transferring TMF data between different eTMF systems (you can find a Charter for the team HERE). The published standard will include a specification document, exchange.xml file and a XSD Schema. The source eTMF system would output the artifacts contained within a predefined folder structure with an accompanying exchange.xml file which provides an inventory of the files being transferred. 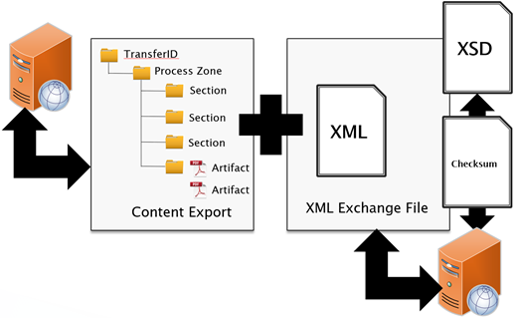 When a system exports an exchange.xml file and related attributes, there should be a validation of the XML file using the exchange.xsd schema provided as part of the standard. When the receiving system imports the exchange.xml file, it will perform the same checks (validation of XML and verification of checksums). Once all checks have passed, the system will import the artifacts and file them against the relevant TMF RM artifact numbers within the system. What are some potential use cases? The eTMF-EMS team has published the specification for the eTMF Exchange Mechanism Standard (eTMF-EMS) v1.0. This was launched at the DIA Global meeting in Boston in June 2018 (download slides here). eTMF vendors will test eTMF-EMS v1.0 to validate its use in exporting and importing TMF packages. The final step is to perform a Proof-of-Concept using a real world migration scenario involving Sponsors, CROs and eTMF Vendors. Regular news regarding the eTMF Exchange Mechanism Standard can be found on our EMS News page. If you have any queries regarding the Exchange Mechanism Standard, please contact us using the form below. 1Standard: the term is used here in its general sense i.e. “used or accepted as normal or average; viewed as authoritative and so widely read”. Currently, the specification will not be authorized or published by a recognized standards body, though this may be considered at a future time. Following the closure of the OASIS eTMF Technical Committee prior to finalization of an eTMF standard, this is the only eTMF technical standard under development at this time and has the support of all major eTMF vendors.